Are you looking for a summer craft project? Look no further than bunting! It’s one of the best summer accessories and can be put to all kinds of fun uses. Here are some of our favourites, with tutorials to guide you on your brilliant bunting adventure. Get ready, your summer is about to get crafty. The Purple Pumpkin’s bunting will have your tent looking fabulous in no time. This summery floral and polka-dot bunting is the creation of crafter Michelle who originally designed it for the Queen’s Diamond Jubilee. We think this bunting would also make the perfect adornment for your summer fete stall or garden party so why not head over to Michelle’s blog, Purple Pumpkin for detailed instructions? If you’re not natural with a needle and thread, Michelle has teamed up with the team at Juggle Mum to show you how to make some quick and easy no-sew bunting, too. Or for something a bit different, check out this rustic wooden bunting over at Boho Weddings. This bunting gives the illusion of feathers floating in the air. When Kate and Mark got married, it was a dreamy DIY affair complete with paper lavender confetti cones and an intriguing table seating plan made from deer antlers. 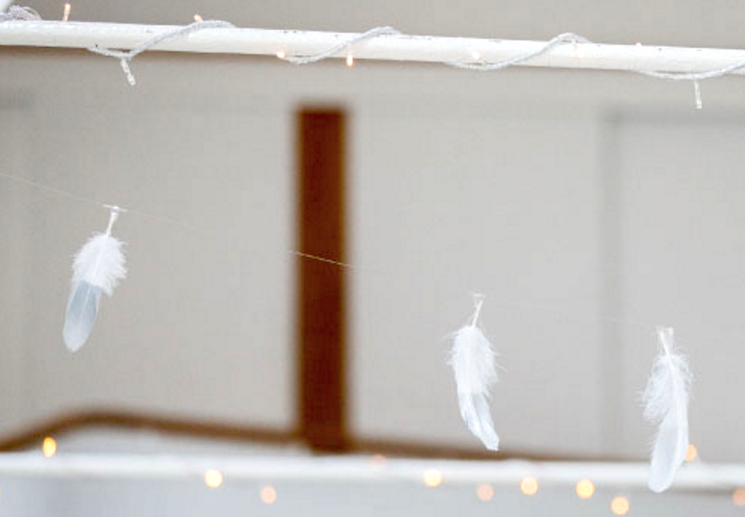 But the standout DIY decoration was the heavenly feather bunting they made. The couple used silver spray paint for the tips of the feathers but you could use whatever colour you like to match your feather bunting to your theme. We think you’ll agree that this makes a great alternative to fabric bunting for a wedding or any special occasion that needs a dash of magic. And you could always combine the bunting with some fairy lights for added sparkle. You’ll find step-by-step instructions on the stylish Rock My Wedding blog. 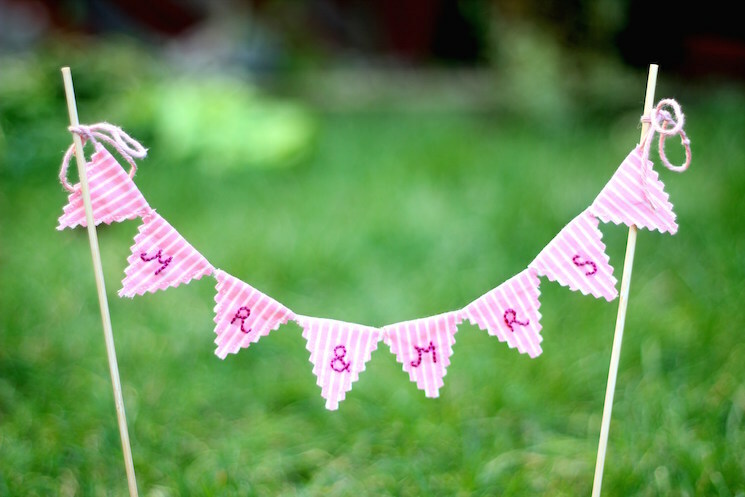 Cake bunting is the perfect wedding cake topper this summer season. With the next season of Great British Bake Off just around the corner, what better way to celebrate than by creating your very own cake bunting? You can keep the bunting plain or for that extra wow factor, take the time to embroider a word or phrase. Just pick out your desired fabric and head over to Little Button Diaries for the instructions, and prepare to make Mary Berry proud. If you don’t have the time to make your own cake decorations, do make sure you check out our ready made cake bunting. We offer themed cake decorations for kids as well as a selection of tasteful cake bunting for grown-ups. The sun’s always shining with Sandra’s summer lace bunting. 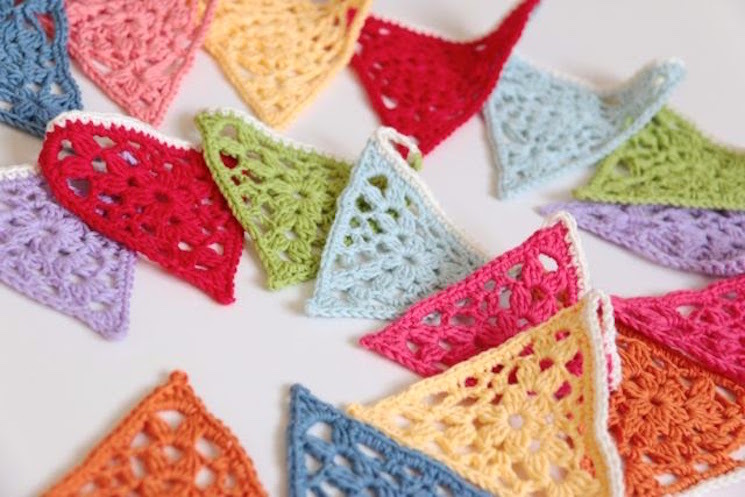 If you’re new to crochet, you can still make this wonderful bunting because Sandra’s 'Crochet Corner' is stuffed with tips, tricks, and tutorials, including a comprehensive stitch directory, to help you learn. Bunting gives Artemis Russell’s beautiful shed a touch of quirk and colour. Next time the sun shines, why not take full advantage of the dry weather to give your drab garden shed a stylish makeover? For some inspiring decor ideas and tips, check out Artemis Russell’s excellent Junkaholique blog. 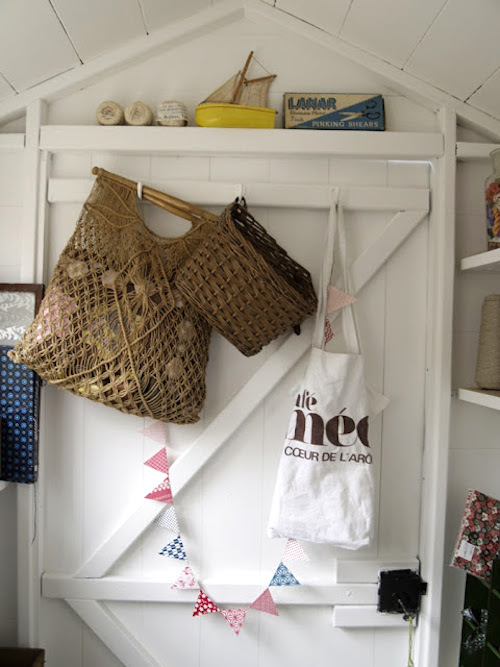 She uses bunting to great effect in her beautiful shed transformation. To make her tiny paper bunting, take a selection of colourful scraps of paper, put on the kettle and something fun on the TV, and get busy with the scissors making triangles. Once you’ve done that, Artemis says all you need to do is: 'Fold over the top edge slightly, and snip of the corners that stick out. Spread a quick drying glue in the crease and slot on the string and press until the glue dries.' And hey presto! You’ve got yourself some bunting for your newly decorated shed. This DIY Bike Basket Bunting is an adorable summery accessory. Bunting gives even the most mundane of objects an arty lift - like this bike basket bunting. Cambridge-based Claire of Claireabellemakes’ adorable DIY bike bunting is guaranteed to make even the shabbiest of bikes look stylish. She speeds up the process of cutting out her triangles by using a rotary cutter to slice through several layers of fabric at once and secures the bunting to her bike basket with super strong clear nylon thread. With your bike suitably adorned, all you need is a picnic and a picturesque destination for your perfect summer day out. Rosé and cupcakes by the river, anyone? Want to surround yourself with bunting this summer, but don’t have the time or the crafty skills? There’s a wonderful selection for you to choose from at dotcomgiftshop. 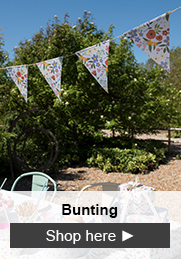 The Union Jack bunting (above) was used in The Great British Bake Off and would make a great garden party decoration. We’re big fans of the Rambling Rose paper fan bunting (also above)! It would be a great wedding decoration.